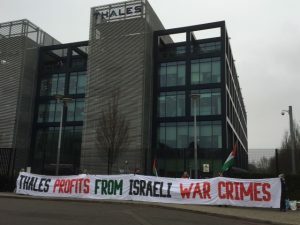 Human rights campaigners today held a demonstration outside the Thales arms factory in Crawley to protest the company’s collaboration with Israeli arms giant Elbit Systems in the manufacture of drones used against the Palestinian population of Gaza. In parallel protests, there were demonstrations at other Elbit factories in the UK. Monday was therefore the first co-ordinated national day of action against Elbit Systems in the UK. Thales (UK) works with the Israeli arms company Elbit Systems to develop the Watchkeeper drone, modelled on Elbit’s Hermes 450 drone used extensively over Gaza. Thales therefore profits from Israel’s war crimes and is a major target in the STOP ARMING ISRAEL campaign. Activists from Brighton and Hove were joined by activists from Hastings and from the Crawley Green Party, who wished to support the ‘Arms to Renewals’ message of the demonstration. The Crawley factory is one of Thales’s largest facilities in the UK. The Crawley factory has been the target of several earlier protests in 2016. Thales’s other sites have been targeted for protest by human rights protesters. 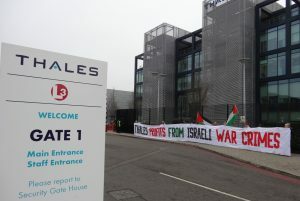 For example, in September 2014 activists from Glasgow Palestine Action staged a protest at the Thales site in Govan (http://www.bbc.co.uk/news/uk-scotland-glasgow-west-29325338). Several of Thales’s sites in France have also been targeted for protest. The Crawley demonstration was organised by Sussex Stop Arming Israel (SSAI), a coalition of groups and individuals campaigning for justice for the Palestinian people by exposing companies in Sussex complicit in war crimes by the Israeli regime. SSAI is part of the wider global Stop Arming Israel movement, which in the UK campaigns for an arms embargo – an end to the deadly and lucrative arms trade between Israel and the UK (stoparmingisrael.org). This in turn is one element of the international movement for Boycott, Divestment and Sanctions against Israel in support of the Palestinians’ liberation struggle (see bdsmovement.net).